World Traditional Archery Federation is presented by divisions in 54 countries of the world. Ukraine joined Federation in 2013. Since we try to attract the admirers of traditional bow and instinctive archery, to improve their skills, and to conduct dynamic and interesting competitions and tournaments. From the moment the official certificated representative office of the World Traditional Archery Federation in Ukraine (ВФТСЛУ or WTAF Ukraine) was founded in 2016, our federation has conducted more than 20 full-scale various competitions aimed to development of traditional archery in our country (Cross Archery, Wild Field, Duels, Full Experience/Archery skills, Archery Tradition 2017, correspondent tournaments). 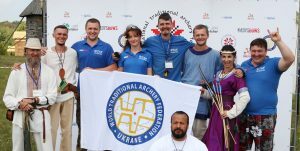 WTAF Ukraine has distinguished the competitions of sport direction – Cross Archery, practical archery – Wild Field, and was the first to introduce qualification and standardization of skills of traditional archers in Ukraine. We have divided archers into ranks according to their experience and tested system of determination of archer’s level in an attestation tournament – Full Experience/Archery skills. The international festival “Archery Tradition” has helped us ether improve the way of conducting competitions on traditional archery in Ukraine and also became a serious attempt in strengthening the status of this country in the International Archery Association. This festival united about 100 archers from 6 countries and enabled them to test themselves in all types of traditional archery – target, practical, dynamic and long range shooting. While planning, preparing and conducting this festival the WTAF Ukraine team has passed a real test on durability, in which we have won and were able to prove that together we are a strong team able for great deeds.